The history of Wayskin starts in September 2014, according to the official website, WayWearable is a start-up established in December 2014 - they got investors as well as they used crowdfunding to found their first product called Wayskin. The first devices came out in January 2016, right now Wayskin is working on another device - LED treatment device. If you watch Kdramas then you might see Wayskin in a drama called Woman Of Dignity (if I'm right in Episode 8). 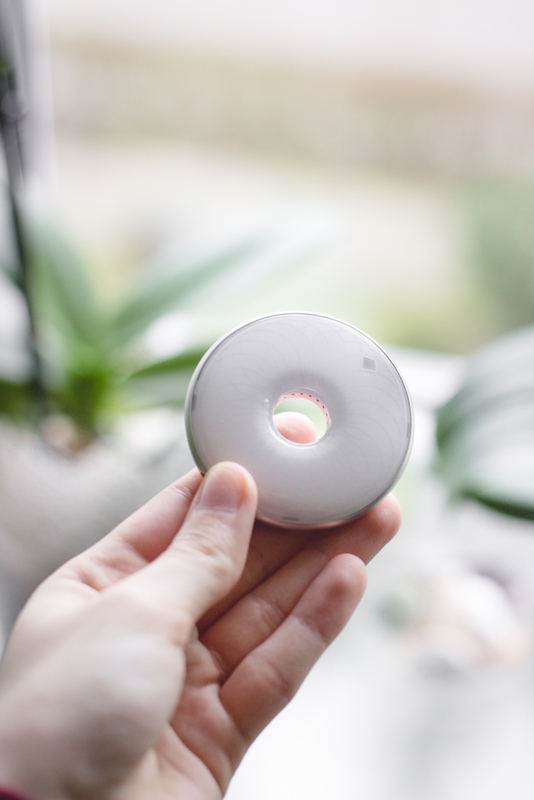 But what exactly does this little doughnut-shaped device do to my skin? Wayskin is a BIA skin analyser. BIA stands for Bioelectrical Impedance Analysis, a non-invasive way to measure water content in a body. It's not all, it does not only measure and analyse your skin water content but it also measures humidity, temperature and UV levels. The Wayskin app uses not only the device to analyze environmental data but it also connects with national weather service (probably a Korean one since Wayskin is a South Korean product). The only factor that device can't measure but it still going to show you results on this factor from national weather service is PM level - PM stands for particulate matter and it shows you if air is good or not. The app can help you track period cycle and water intake as well as your routine but we will discuss it later because there is something good and bad about these options. I believe that this device may look like a device related to the period but it's a very unique and minimalistic design that has literally nothing to do with a period - besides one feature in the app. I'm sure you're wondering what's inside the box. The box contains a device, USB cable, short instruction, velvet pouch (more like microfibre pouch) and microfibre cloth. The device is not waterproof - if you want to clean it, you just have to use a cloth. To use the Wayskin, you'll need an iPhone with iOS 8.0 or above, unless you're an Android user then you will need Android 4.3 or above, you'll also need Bluetooth 4.0. The app uses GPS module to find your localisation... in my case, the app finds me in Berlin instead of the town where I live but it's still better than finding me in Warsaw - I've got fewer kilometres to Berlin than to Warsaw, I know that iOS app has it corrected but I'm still waiting for Android update, the latest update from December 22nd didn't change this bug. You can see that this product contains UV and humidity sensors but it can also light and vibrate - it does both while taking the measure/skin test. Thanks to this two small details you know when it works. There's only one button on the device - you use this button to turn the device on or just to wake it up. The producer claims that the device can last 5-7 days on battery and then you have to charge it but I know that it can last about 7-9 days, it's winter now and because I keep it near my window the battery dies quicker than it'll be in the summer. You can choose two versions - white&silver or black&gold, the black&gold versions have red light instead of white light and it looks a little bit like Sauron's eye. The device itself is very light - only about 23,5g and it's 3 times smaller than the screen of my phone. Every product has it's good and bad sites and after over a month with this device, I can see some things clearly. Through this time, the app was updated once and it's a good result, the previous update was on November 1st and the current update was on December 22nd, when I'm making this post the latest firmware version is 4.0.2, firmware and app updates are two different things. The Wayskin app is connected to the device, without it, you can't use all the app functions - you can just make records or check your skin type or age. Each user has its own account where the data is being stored, the connection between app and device is through Bluetooth, if you touch the icon with a battery status - it'll show you a page with serial number and all information as well as connect/disconnect button and "find my device" option which is lovely if you keep Wayskin in your bag or if you need to find it in the darkness (what I usually do because I like to check my skin before I go to sleep). It's good to build some routines - to check your skin in similar hours but it's not necessary. Sometimes the app will show you some notifications like go to sleep but usually, it's more about humidity and some skincare tips. There's one very important thing - the device can't measure your skin when it's charging or when it tries to sync data. There are two ways of checking your skin - a skin scan or a quick skin scan - the quick option is good if your friend wants to check their skin or if you want to check legs for example but you don't want to save the data - yes I did check my legs, they were way more dried than Sahara. When you set your account you can take skin type test, I took this test twice since my opinion about this skin was way worse than it really is, that's why second time I've asked my mom and friends to help me, the difference in skin age was very different, if it comes to skin type - that's what I was expecting - combination & sensitive and age 18 - once it turned 20 but with a good moisture it quickly went back to 18. The skin age is calculated from your data - the app will show you questions like "do you smoke?" or it'll show you three different photos and ask "which photo is the most similar to your skin condition", it focuses on wrinkles, pigment, pores, your lifestyle and obviously moisture so the real age of your skin can be a little bit different. One of the features which might be very useful if you've got hormonal acne is period tracking - the app is showing some tips related to your current menstrual cycle. The only thing that I don't like about this option is lack of synchronisation with period apps like Clue, in the beginning of use the app might not be correct with period since every woman is different and if you don't have consistent cycle it might take a while for app to learn more about your period. You can also track water - I barely use it since I hate drinking pure water and again - you can't sync it with apps related to water drinking. I can admit that I'm addicted to making lists? Or something like that, I just have some excel files where I store all the data - when I bought a product, when I used it for the first time, what's a shelf life of this product, etc. The app contains a small base of the product, you've got a virtual "shelf" of product in use and product that you're going to use, the app will show you average skin moisture while using the product, if you check the product you'll see the opinions of the community but this option still needs to be developed, the base of the product is very small, during this month it wasn't updated, you can't really write anything in a feedback to the product and the product recommendation - I wish that I could hide recommendations of product which I've tried before and I don't like them. It would be great if we could check prices of products in an app - the new version of the app is connected to some online store where you can purchase the product but I didn't check the website, it would be nice if the app could connect with several shops to give us the best price. I also feel like Wayskin app should have a way to check the ingredients of the product, I'm allergic to wheat in cosmetics and I wish I could check ingredients in-app or tell the app not to show me content that might not be good to my skin because the product might be comedogenic or might cause an allergic reaction but that's only my idea. There's also another recommendation section - the app will share with you up to 2 articles related to your skin, it's a nice way to find some new websites but sometimes it feels like I see a commercial - especially one article on blog where the blogger clearly claimed that the post was made in collaboration with L'oreal - even if you won't find L'oreal in product base and the articles have nothing to do with skincare, it was more like "what to do when you've got a mask on" but I like that I was recommended some DIY masks too. Personally, I've got a problem with Bluetooth, it takes about 2 minutes to connect the app to the device. Maybe you won't have this problem but I'm not sure if the problem is in fact that I've got too many devices in my apartment and my neighbours aren't better but I've got an excuse. Last but not least, the app supports only couple languages - English, Japanese, Korean, Chinese and Taiwanese, it's not bad. Obviously, the app crashes sometimes on Android but it can happen - for me, it's not a problem, I'm used to bugs and I know that next update can change a lot, I see that updates are quite regular. The biggest disadvantage of this product might be the price and availability - right now the product is available on Wayskin website, SkinID, Glow Recipe and Cult Beauty but if you live in EU you know that the situation with Brexit is not really clear, when I got the device SkinID was the only place where I could buy Wayskin and be sure that I won't have to pay customs or taxes. The price which is about 80$-129$ or even up, depends on the source might be too high up but on the other hand, beauty devices cost even more than Wayskin and it's very individual thing but before you decide to buy it check the taxes/customs to avoid unpleasant surprises. I made that post month ago hoping that I'll publish it as the first post of 2018, a lot of things has changed! The app is more stable now, at this time there were 2 or even 3 updates. What has changed besides stability? Localisation - finally I get all the data for the city where I live, I still haven't tested it in another city but I might do this soon, new products were introduced to Wayskin such as their own Seoul Cream and some new brands which we couldn't see before in the app like Eve Lom, Human + Kind or J.One. I also have a feeling that Wayskin is focused on American brands which aren't always available in Europe or even Asia and we have to remember that this tiny device came from Asian country and the main users are ones interested in Kbeauty as well as Asian Beauty (yes, Japanese, Taiwanese and other Asian brands are also popular, even if I barely ever speak about them because my Japanese is pretty bad and figuring the ingredients takes longer than with Korean brands). We've got more recommendations and tips although recommendations for my localisations are usually SK-II or other brands which are unavailable here (besides Whamisa and Leegeehaam/Leejiham which you can easily buy online here). In this post I couldn't be able to show you the app - how does it work step by step but I'm planning another post with a video tutorial about Wayskin. If you have any other questions related to Wayskin please let me know - I'll try to focus on them in the next post related to technology & skin analyzers. Wayskin has changed my skincare - I've started to use less makeup or even avoid makeup if it's unnecessary, I've tried to drink more water but drinking 2l of water every day is impossible - I felt like I'm not going to sleep because I need to use the toilet every 5 minutes. I've started to use face mists and in the last month, I skipped skincare only 2 times which is a new record for me. I can clearly see if the new product in my routine works for me and if I can recommend it here on blog or not. 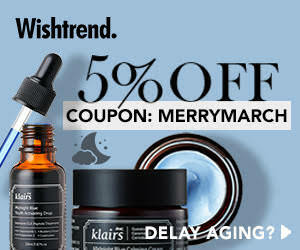 It's a nice gadget, it can help with your skin care but is it worth the money and is it necessary for your skincare? It's an individual thing. How do you like Wayskin device? Is there any beauty device you want to try? Do you think that beauty devices are going to be more popular soon or if they are unnecessary?